The crunchy vegetables require a chilled white wine, and a Chablis would make a perfect pairing; its minerality, vigor, and sophistication perfectly echoing the dish. It would also beautifully balance out the creaminess of the quiche. Combine the ingredients for the pastry in a bowl, bring together into a dough, and then set aside for 10-15 minutes. Meanwhile, cut the broccoli into florets and wash and halve the tomatoes. Peel the carrots and the zucchini and cut into thin strips. Defrost the peas, peel the onion and slice finely. Once the pastry is rested, roll into a circle and place in a buttered quiche tin. Pierce with a fork in a few places. Beat the ingredients for the egg mixture. 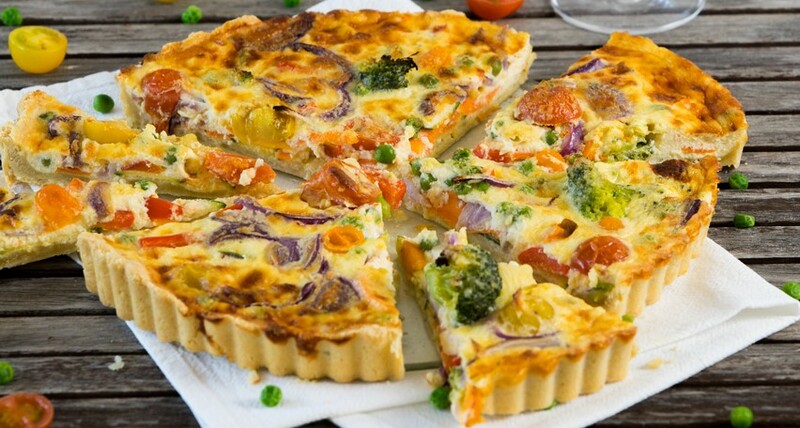 Arrange the vegetables on the pastry and pour the egg mixture over the top. Respond, @Chablis will answer you! Your comment may be deleted if it does not respect the blog charter.